Dr. Siobhan O’Dwyer Qantas miss hiccup: Victim of sexism? Dr. Siobhan O’Dwer: A victim of sexism at the hands of Qantas? Dr. Siobhan Dwyer a UK based Australian philosophy academic accuses Qantas Airlines of sexism after being called miss instead of Doctor during recent flight. A female passenger with a Ph.d flying Australia’s Qantas airlines has found herself being trolled on social media after taking exception to being called ‘miss’ instead of ‘doctor,’ insisting that she was a victim of sexism. Or was she? 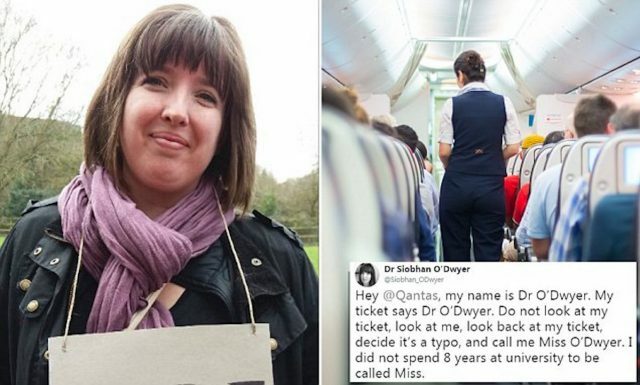 In a post since gone viral, Dr. Siobhan O’Dwyer took a dig at Qantas Airways after one of its flight attendants addressed her as ‘Miss O’Dwyer.’ A slight of hand that O’Dwer took great exception to. Posted O’Dwyer, ‘Hey @Qantas, my name is Dr O’Dwyer. My ticket says Dr O’Dwyer. Do not look at my ticket, look at me, look back at my ticket, decide it’s a typo, and call me Miss O’Dwyer. I did not spend 8 years at university to be called Miss’. According to the University of Exeter in the UK, the school’s website lists her working as a senior lecturer in Aging and Family Care and receiving her doctor of philosophy degree in 2009. Her post has since gone viral, garnering more than 8,700 likes and 4,800 comments, including dozens that point out she doesn’t deserve the lofty salutation often designated to ‘medical’ doctors. Another person, @MakaylaLouiseee, was empathetic toward the Qantas staff. The hate mail prompted O’Dwyer to follow up with an explanation. ‘Copping so much flack for this tweet. This was not about my ego. It was about highlighting one of a thousand instances of sexism that women encounter every day. It’s not about the title, it’s about the fact that this wouldn’t have happened if I was a man,’ she wrote on Sunday. Which is to wonder had this male author being confused as a ‘sir’ or even, ‘hey Mr.’ instead of ‘Dr’ (assuming I had a doctorate) on a Qantas airlines flight – would I have been offended or arrived at the view that I had been denigrated by staff who failed to observe my moral superiority as the master gender? Needless to say, O’Dwyer’s response set the wheels in motion once again, albeit with more venom. ‘I’m first gen to finish high school (let alone get several degrees) in my family … I’ll be damned if some trolley dolly gets to decide what honorific I get called, FFS’. Adding, ‘We may not have completed a PhD however we are required by law 2 maintain quals (sic) that enable us to evacuate an aircraft in 90 secs, keep u alive in-flight, prevent hijacking, put out fires etc’. Which is to wonder does sexism only matter when women of certain egos, profession, status and income levels feel threatened and believe society getting ahead at their great expense. If only some of the passengers also accorded the same respect as well…. You confronting @Qantas flight attendant was not about ego? The fact that your ticket said “Dr. ODwyer” was ALL about ego. It should’ve said Siobhan ODwyer and nothing more. You booked it as “Dr.” for special treatment. My ex did the same thing; for ego. You make me sick. Miss O’Dwyer, you need to get over yourself, The flight attendant was being polite to call you miss. Just because you have a phD does not mean that people have to bow down to you and respect the title. Hi Jaimee, thanks for your message. I’m turning down all media invitations because the online response has been so vitriolic & I don’t want to provide further opportunities for attack. Thanks for your interest though, it’s most appreciated.